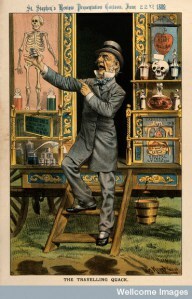 The increasingly rapid growth and complexity of medical knowledge in twentieth century American medicine resulted in the creation of specialties and subspecialties. 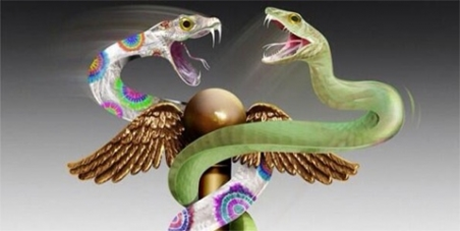 A related development was the creation of “boards” to “certify” physicians as knowledgeable and competent in the specialties and subspecialties in which they claimed to have expertise. The American Board of Ophthalmology, organized in 1917, was the first of these. As the number of medical specialties proliferated an umbrella organization was formed to accomplish this task. 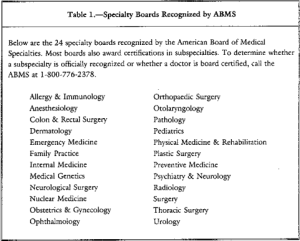 The Advisory Board for Medical Specialties was created in 1933 and reorganized as the American Board of Medical Specialties (ABMS) in 1970. This non-profit organization oversees board certification of all physician specialists and sub-specialists in the United States. The ABMS recognizes 24 medical specialties in which physicians can pursue additional training and education to pursue Board Certification.